As CES inches towards us, Creative has quietly released its latest gaming headset, the HS-1100 Tournament Gaming Headset. 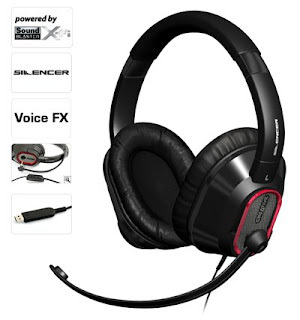 This X-Fi enhanced headset features a new silencer techonology ("...Silencer intelligently eliminates ambient background noise to provide improved voice fidelity"), voice FX software (so you can continue to prey the web with a fake voice) which uses the USB interface. We like the looks of the HS-1100 especially the detachable mic but you know, we are just looking forward to the Zii.